When training horses most of us aspire to being sure things are always beautiful and smooth, full of building confidence and an understanding between human and horse. BUT if you have trained horses for any amount of time you know that things don’t always end up being beautiful or feeling wonderful. Sometimes things fall apart for both the horse and human and we end up feeling drained, worn out, and frustrated. Sometimes things are going awesome and then “all of a sudden” the horse can’t handle what we are doing. Out of the blue they have a melt down and seem to have forgotten everything we have done leading up to the melt down. At that moment you have a choice. To battle it out with them or to STOP. I have learned, over the years, that stopping as soon as possible, is the best option for both human and horse. This idea that if we stop before the horse understands means the horse wins is actually kind of antiquated. This what I mean when I say Choose Your Battles. How big is the melt down? Is the horse afraid or just having a little fit? Dealing with a scared horse will mean a whole different set of rules than dealing with a horse that is just throwing a little fit and needs to just get it over with. A scared horse can not learn while feeling scared. For example, if I have a horse that has pulled a travois in the past and then suddenly freaks out and just can’t handle pulling the travois, I will remove the travois immediately. Don’t keep trying to get the horse comfortable with the travois. A scared horse can not learn, but will remember how scared they were and that will be the lesson that sticks. Train your horse for tomorrow. That’s my motto. So if my horse is freaking out and afraid of the travois get the travois off as soon as you can, even if getting it off is a little ugly, unbuckle the traces, unbuckle the shaft loops, take the harness off, just get the travois off the horse. Then go back several steps. Depending on how ugly things got with the travois, you may need to end that part of the session there and go back to things later. You can go back to things later that day, as that is the same as starting a new session the next day, or you can wait until the next day. The key is going to be how the horse feels about you after the melt down. So do not put the horse away scared. Do something with the horse where he can feel like he’s smart and understands what you want. Don’t yank everything off and then just put him away or tie him up. Please do understand that the horse is equating everything you do with him with you. You are the key to helping him feel confident about the travois or the harness or the ? In Parelli they always say it’s not about the trailer, or it’s not about the travois. It is in fact about how you handle the situation and what you do with the horse after the melt down. Go back and do something they are completely confident with. For Zorro that is stepping on things, the bridge, a tarp, a cone, a piece of card board. He also likes to play touch it, which is when he goes around and puts his nose on different things to earn a cookie, such as touching a cone, or a fence post, or a jolly ball, or my dog Samson. Zorro also loves to be groomed. So I could go spend some quality time brushing him to help him feel more confident and connected to me. Then if the grass is available, I would take him around to eat at all the best grass places I can find. You don’t have to spend a lot of time doing this but may find that you also feel better, calmer and more able to tackle the problem after spending some undemanding time with your pony. Then when you are ready to tackle the issue again, make it a smaller issue. If it’s a travois issue, zero in on whether it’s because of the noise of the travois. If that is the cause of the melt down, then drag a cone to start with. Or a jolly ball. Start by dragging the jolly ball or cone in front of him so he can gain some confidence by following the “scary” object. For some this may take a little time and for others this may be all you can do for the day! Just be sure you end this on a note of calm confidence. Use some rope attached to your breast collar and then tie a rope to the cone or ball and hold one end so if the dragging of it scares them you can quickly drop the rope and reset. Then you can test by just allowing them to drag the ball or cone! If they can do this with confidence then you can move up to dragging the travois, or just one side of the travios to start. But when you do that, start at the beginning again and drag it while allowing the pony to follow it, then allow them to gradually move up until they are beside it, then try putting it through the shaft loops. Sometimes, because we are so direct line, we don’t stick with the little things long enough. We have to give them the time they need to feel calm and confident about each and every step. No matter if you can go straight to the travois or need to take all these baby steps. How you manage these little things will mean everything to your pony. If the confinement of the shafts of the travois are the issue, then start smaller. Take a look at the Small Travois. Or consider putting only one side of the travois on, just one of the PVC pipes. Or use a couple of pool noodles, or just use some soft rope that they can have drape along their sides. Don’t be afraid to go backwards in order to move forward with your horse. If you continue to throw the big things at him he will continue to lose confidence in you and neither of you will “win” the battle. 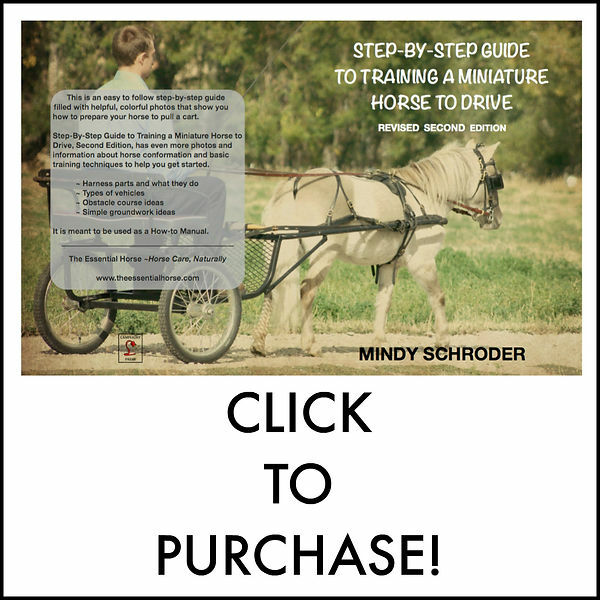 In my book I outline the steps I use to train a horse to drive. These steps are simply a way to make a map for your ultimate outcome which is to have a horse that you can drive. But how you accomplish those steps is different for each horse. I do say this all the time, but I don’t think people understand just how long I spend on each step with each individual horse. It can be hard to explain just how much time these steps take. It can differ for each horse and starting a young, un-started pony can be much less complicated than re-starting an older horse. The trick is not to rush them. And to be flexible. So if something goes wrong, go back. Make the steps smaller. In positive reinforcement they call this “slicing a behavior” to make it easier for the horse to understand and accept. The key thing to take away from this post is that a scared horse, one that is having a melt down and continues to be fearful and is not being calm and connected, is not a learning horse. So as soon as you can set things up to help your horse be confident and calm again, the faster your horse will get over the melt down and start to learn again. Train your horse today, for tomorrow. And ending on a good note does not necessarily mean that you have to win the battle and the horse has to lose. In fact stepping back from the scary part of the training and regaining confidence means that you have both won today.